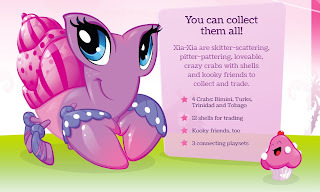 Xia Xia Pets: Is there an official website for Xia-Xia Pets? Some of you obviously are interested to visit the official website of Xia Xia pets. Here it is click here to visit the official website. I also attached the screen-shot from the site, it's still under construction, but it's already very cute and colorful. I hope you like the picture, it's very sweet. See you soon, next time I'm going to show you the picture of available Xia Xia crabs and playsets.